The human form, queens, hearts, trees and houses are the reoccurring focal points in my work. I am especially enamored of portraying women whose strength and enduring spirit can be seen behind the melancholy expressions which grace their faces. These women testify to the often sorrowful lives of people worldwide, and announce that the human spirit can-and will-endure in the face of trials and tribulations. My primary medium is paint and utilizing various and complex techniques from my experience as a professional faux finisher. I begin each piece by giving careful attention to textural surface preparation. My paintings are inspired by my life, the joys, the difficulties, the challenges, the successes, and the landscapes of my memories. The creative process of painting is very therapeutic. Painting soothes my spirit and creates a balance in my life. Some of my work is imbued with a sense of "whimsy". Other pieces allow the viewer to step out of the dailyness of their life and into the delight of their imagination. I strive to pass the joy that I receive in creating, onto those who view my work and take it into their homes as well as their hearts. 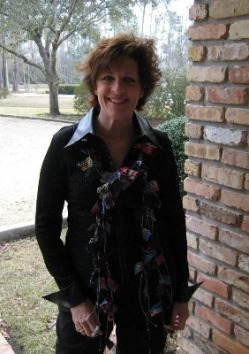 Michelle is a Gulf Coast artist who resides in Pass Christian, Mississippi. Her primary medium is acrylic paints, which she applies to unique textural surfaces. While Michelle has taken instruction internationally in various art techniques, she is primarily self-taught. 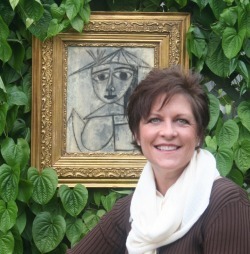 Michelle has exhibited her work in galleries in Arizona, Texas, New Jersey, Virginia, Mississippi, Washington D.C. and Louisiana. Michelle began her art career as a "faux finish decorative painter" in the early 1990s, working in various locations across the South. After a time, Michelle began to use canvas as her creative pallet. Using her knowledge of paint and compounds as well as assorted glazes, she treats her canvas with textured putty, sandpaper, and then paints her images.